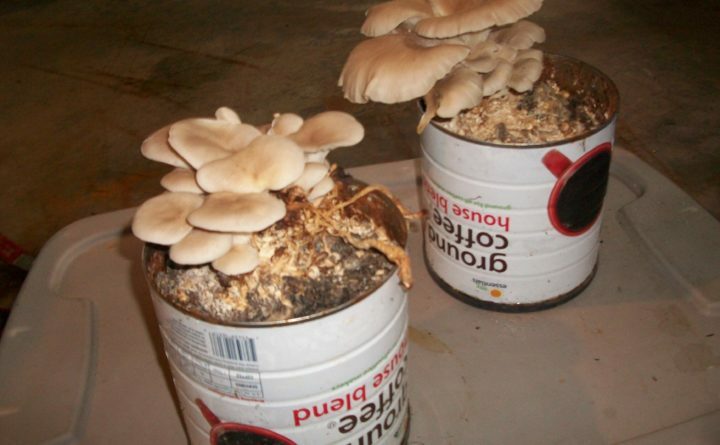 Oyster mushrooms are growing out of coffee cans in a medium of coffee grounds and cardboard after a simple process that takes two to three months. Want to try growing your own mushrooms? According to mushroom enthusiast Mike McNally of Brunswick, growing oyster mushrooms in a coffee can is inexpensive, easy and could yield some delicious results. All you need is an oyster mushroom from the store (or the wild, if you’re ambitious), an empty coffee can, spent coffee grinds, some cardboard and some common household items, such as plastic wrap. A member of the Maine Mycological Association, McNally writes about mushroom cultivation for the association’s newsletter and has led several workshops on the topic. At his home in Brunswick, he grows a variety of mushrooms a variety of ways, and he enjoys sharing his experiments with others. Oyster mushrooms are one of the easiest mushrooms to grow indoors, he said. Nevertheless, growing them requires patience, and yielding a good crop isn’t guaranteed. Sometimes you can do everything right, and the mushrooms simply won’t grow. 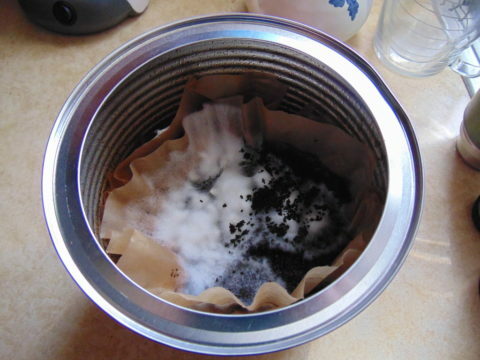 Step 1: Save your spent coffee grounds by placing them (with the used filters) in a coffee can. Fill about half of the can. The time this takes varies depending on how much you drink coffee. Step 2: Set water to boil in a pot or kettle. Cut several pieces of cardboard so they fit in the plastic container you’re using. Stack the cardboard pieces inside the container, and pour the boiling water over the cardboard. Let the cardboard soak for 15-20 minutes or until it’s cool enough for you to handle, then squeeze as much moisture out of the cardboard as possible. Step 3: Mince the oyster mushroom. Then, in the container, sprinkle the tiny mushroom pieces in between the cardboard, creating layers. 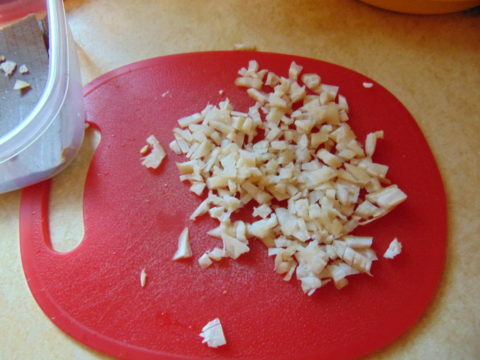 An oyster mushroom is diced up as a beginning step for growing mushrooms in coffee grounds. Step 4: Place a top on the container and place it in a dark area (under your sink or in a cabinet) and leave it for about two weeks. Look inside the container and you will notice a cottony white growth, much like mold. This is mushroom mycelium, the vegetative part of the fungus. And the cardboard-mycelium combination is called “spawn,” which is the term used for any substance that has been inoculated with mycelium. Step 5: Carefully take the filters full of spent coffee grounds out of the coffee can, then layer the inoculated pieces of cardboard with the filters of coffee grounds. This can be done over time if you don’t have enough coffee grounds yet. When the coffee can is full, put a plastic top on the can and let it rest for two to three months. Be sure to write a date on it. 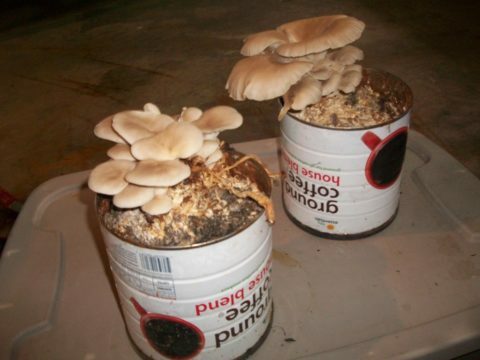 The mycelium or vegetative growth of oyster mushrooms is visible in the spent coffee grinds of the coffee can. Step 6: After two to three months, remove the lid from the can. Cover the top of the can with plastic wrap, secured by a rubber band, them punch a three or four small holes in the plastic. Spritz the top of the can with water two or three times a day. Another option is to leave the top open, without plastic wrap, and place it in a room (like a basement or garage) in front of a humidifier. You can also place the can outside in a shady area during spring, summer or fall, but this may be a problem in mid summer when certain insects lay their eggs in mushrooms. Step 7: Wait patiently the mushrooms to pop up out of the can. This is called a “flush” or “crop” of mushrooms. Step 8: You can harvest the mushrooms and continue misting them for additional crops. And cnce the mycelium isn’t fruiting anymore, dump the contents of the can in a compost pile to decompose.